If you love a man in uniform, add our military gnomes to your collection. Our U.S. Air Force, Navy and Army gnomes come dressed in accurate uniforms with intricate detailing that your veteran will appreciate. These patriotic garden gnomes are perfect gifts for retiring military men and women, or a great way to pay homage to your military background in your backyard. 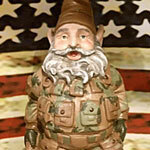 Give our U.S. military gnomes a salute when you enter your garden. Our 14-inch styles are coated with a weather-resistant cast stone resin, designed to withstand the elements to stay looking brand new for years to come. Our Commander in Chief gnome is one of our top choices. 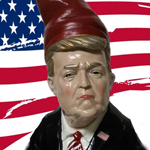 This patriotic garden gnome, designed to look just like our president, will be the boss of your garden. Each Commander in Chief statue comes wearing a dark suit, striped tie and the presidential American flag lapel pin. Our 15-inch Barack Obama gnome will keep your garden looking regal long after his second term comes to an end. Grab this one-of-a-kind gnome for your Obama fanatics or buy it as a gag gift for those on the other side of the fence. Try a fireman or police gnomes for your life-saving friends and family. Each comes fully dressed in his uniform, ready to take on any emergency in your yard. Our sailor gnome is a great gift for any veteran. Add it to your beach house for a nautical look that won�t disappoint. 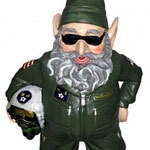 Our U.S. Air Force gnome is an awesome gift for your own Top Gun. 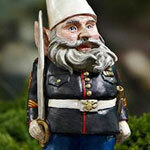 Welcome guests to your home with one of these intricately-designed and accurate military gnomes. Browse our selection of traditional garden gnomes and other fun themes, including retro gnomes and famous character figures. 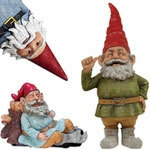 Each of GardenFun�s gnomes will feel right at home in your garden or along your front walkway.